Back when I was still at uni I spotted the Oz Botanics range in the Poundworld in Preston town centre. I’d gone in looking for something to tame my dry/frizzy hair but with no idea what exactly I was looking for. A few people had recommended Argon oil but when I was having a nosy at the hair products this brand really jumped out at me, mainly because it looks SO similar to Aussie shampoo. At first I thought it might just be the bottle and the name but after a cheeky sniff I discovered this brand also has that same to-die-for bubblegum smell as the Aussie brand. Lush. I’ve bought Aussie shampoo before but for some reason it really itches my head and leaves my scalp feeling really uncomfortable for days afterwards. I’m not sure what causes it but after a while I reluctantly accepted that I can’t use it. You can imagine my joy when I spotted this £1 dupe which, amazingly, doesn’t cause any irritation whatsoever (to my head or my purse!). The first products I tried were from the major moisture range (pictured) and they were the shampoo, conditioner, deep conditioner and heat defence spray. Shampoo – The shampoo is very similar in texture to the Aussie shampoo and the smell is like for like. It lathers up okay-ish, I do have to splash a bit of water into the mix to encourage it along but I find I have to do that with most brands – maybe I’m just way too keen on bubbles. I feel like one use washes my hair well enough, due to the thickness and length of it though I do usually wash my hair twice. Conditioner – The regular conditioner isn’t too thick or gloopy, you could even say it’s a bit on the thin side. I usually use this alongside the deep conditioner, if I’m really in a rush I’ll use it alone but the times I’ve used it without any other conditioning products my hair has felt dry afterwards despite the ‘major moisture’ label. My hair is quite dry anyway so anyone with oily hair would probably be fine using this alone, but if you’re looking for a ‘dry hair repair’ then I’d recommend only using this alongside the deep conditioner or skipping it altogether. Deep conditioner – Like I mentioned above, I use this alongside the regular conditioner the majority of the time due to my hair being quite dry, especially now winter is setting in. The packaging says to leave it on for something like 3-5 minutes, I prefer to keep it on a bit longer than that. The texture is really thick and creamy, similar to hair putty or a body butter so can be tricky to rub in properly with wet hands. I usually end up dropping half of it down the side of the bath but even so the tub has only gone down about half way and I’ve been using it twice weekly for about four months. My hair does feel a lot softer for using this product and it helps me feel a little less guilty during the weeks I use a lot of heat styling. Heat defence spray – I’m a little divided on this spray. Whilst I think any heat protection is better than none, I don’t really know if it’s doing much as I have spotted a few split ends creeping in recently which makes me think it isn’t working as well as it should. Saying that, I am due a hair cut soon so that probably contributes too. The bottle is a good size for the price (£1) and it doesn’t seem to go down too quickly, I’m nearing the end of the bottle now and I don’t use it sparingly at all. It smells amazing and used alongside the other conditioning products my hair does feel a lot healthier. There’s probably much better heat defence sprays around but considering how little I’ve been using head recently I probably won’t look for a more expensive alternative just yet. 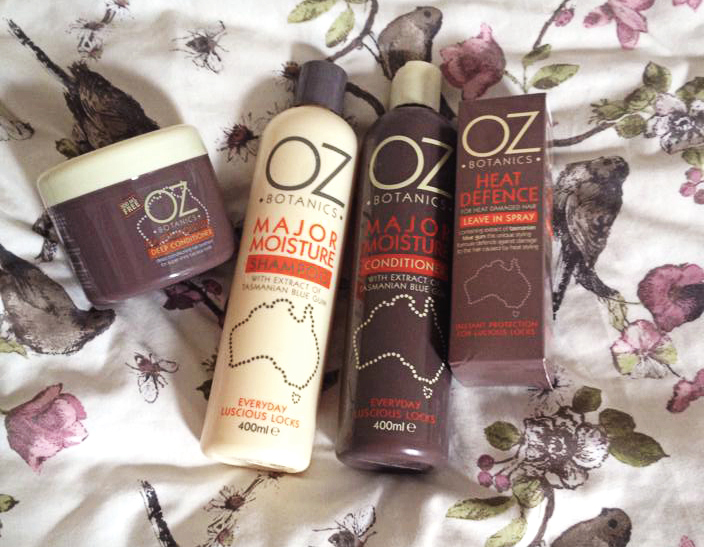 The Oz Botanics brand is really good for those of you who don’t want to pay Aussie prices or like me have found that Aussie products don’t suit your hair. I first bought this in Poundworld but having tried other stores it seems they either don’t stock it anymore or only stocked it in the Preston store due to it being larger than most of their shops. The shampoo/conditioner is also available in Poundland, Home Bargains and I think I heard someone say they’d found it in B&M as well. I’ve yet to find anywhere else that stocks the deep conditioner, which I’m actually quite gutted about as it’s my favourite of the range. Have you tried any Oz Botanics products? What do you think of them?